(Excerpt from Goodreads) Paul Russo’s wife just died. While trying to get his family’s life back in order, Paul is being tormented by a demon who is holding his wife’s spirit hostage on the other side. His fate is intertwined with an old haunted mansion on the north shore of Long Island called Stillwell Manor. Paul must find clues dating back hundreds of years to set his wife’s soul free. Paul Russo’s wife has just died after trying all kinds of drugs to fight her brain tumor. And although it has only been one week since her passing, Paul is not handling it very well. Because of this and the debt, he returns to work. Paul is asked to help sell an estate, Stillwell manor that he remembers from his childhood. Then Stella, the youngest of his children says that she sees the ghost of her mother, Paul just thinks that the child is coping. When he first stars seeing Allison, he figures it is just working through the grief. But Allison is in the hands of a demon. It seems that the original owner of Stillwell manor is in the same position and it is up to Paul to save both of them. This is a great story. The main part is Paul’s love for Allison. Her death has hit him particularly hard but he is trying to keep everything together, especially for the kids. And the paranormal events are just like the ones people generally report which made this really creepy for me. I love how Michael Phillip Cash can write a love story that gives you the creeps. I love all of Michael Phillip Cash’s books and strongly recommend everyone check them out. You will not be disappointed. 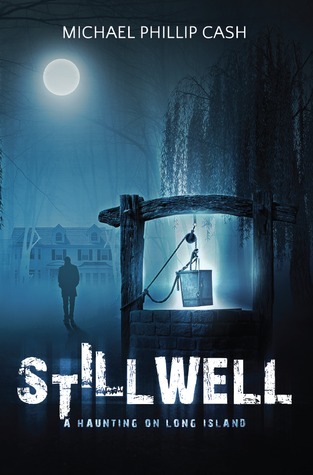 To purchase Stillwell make sure to check out Amazon, Barnes and Noble, Goodreads, and Michael Phillip Cash’s website. I received Stillwell a long time ago for free in exchange for an honest review. (Excerpt from Goodreads) The 1980’s: it’s the time of Dungeons & Dragons, banana clips, and Atari. Jonathan Schwartz is growing up in a family like no other. His sisters, Nadia, the dark genius, and Olivia, the gorgeous tease and temptress, manipulate Jon and his friends for their own entertainment. And his Holocaust survivor grandparents? Their coping techniques are beyond embarrassing. A disastrous visit to Jon’s class by his grandmother unhinges his famous father, setting off a chain of events that threatens to send the dysfunctional Schwartz clan up in flames once and for all. 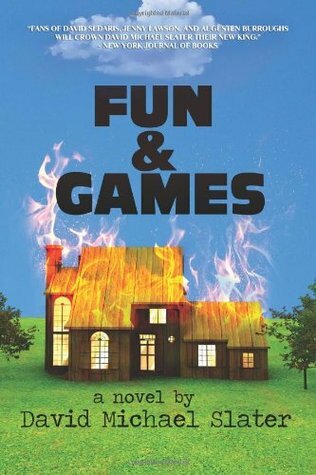 Fun & Games is a heartbreaking and hilarious story of faith, family secrets, betrayal, and loss-but it’s also a tale of friendship, love, and side-splitting shenanigans. On the surface, this is a story about Jonathan Schwartz and growing up in the 80’s. We start with him playing Dungeons & Dragons with his friends while working on a Purity Test. We follow along as Jon deals with daily issues of growing up, getting into trouble with his friends, and going through High School. He is also part of an interesting family. His grandparents survived the Nazi Occupation and have their own way of coping. His father doesn’t believe in Good. And simply family outings have so much more meaning and heartbreak than what is seen on the surface. When Jon goes to college there is a tragedy that changes everything and lets him reflect on his past. This was an interesting story. I grew up in the 80’s and although I didn’t really participate in much Dungeons & Dragons I definitely remember it. I laughed at some of the stuff Jon and his friends get into. But at the same time I felt for him and his family and the things they were going through. Not everything is what it looks like on the surface and Jon’s family is the best example. Even when they go on an adventure I couldn’t help feeling sorry for the grandmother. But the way the book was put together seemed a little disjointed. I understand in different settings, at different times, and with different events things change. Unfortunately this made the book feel choppy moving from on this to another. I think it would have been better if the book would have been broken up. Having said that, Fun & Games is a pretty good book. I did enjoy it and sure remembered growing up and the stuff I got into as a kid. To purchase Fun & Games make sure to check out Amazon, Barnes and Noble, Goodreads and David Michael Slater’s website. I received Fun & Games for free in exchange for an honest review. (Excerpt from Goodreads) Under ordinary circumstances, Ben and Mina would never have had reason to speak to each other; he’s an easy-going people person with a healthy skepticism about the paranormal, and she’s a dangerously obsessive monster-hunter with a crippling fear of betrayal. But the small town of Prospero, California, has no ordinary circumstances to offer. In order to uncover a plot set by the seemingly innocent but definitely shapeshifting monsters-that-look-like-friends-family-and-neighbors, the two stark opposites must both find ways to put aside their differences and learn to trust each other. Ben has returned to Prospero, CA to attend the funeral of a friend, Haley. But while there she is discovered. But things are not as they seem. Odd ball Mina has been fighting the Splinters for years and knows Haley is a Splinter. A Splinter is a centipede like alien that attached itself to humans or animals and wants to take over Earth. Mina knows that Ben is new to this attack and tries to recruit him to the fight. Unfortunately, because of her fighting the Splinter, Mina is socially awkward, has no friends, and has a hard time trying to tell Ben about the Splinters. There is a lot more to Prospero, CA than meets the eye. 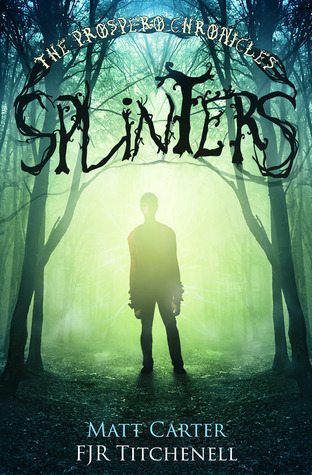 To purchase Splinters make sure to check out Amazon, Barnes and Noble, Goodreads, FJR Titchell’s website and Matt Carter’s website.